EPBOT: Let's Have Lunch In Pandora! 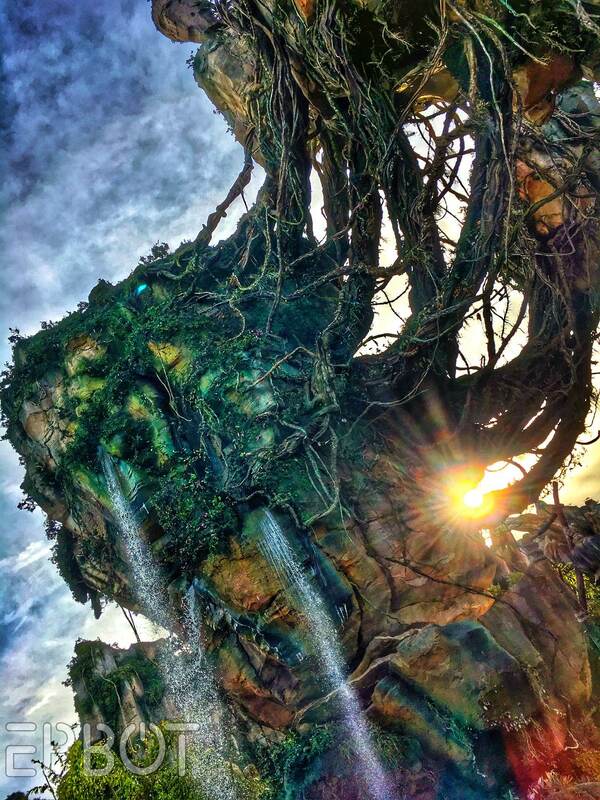 Don't mind me, just sliding in here to share a few photos I took in Disney's Pandora last week. Fun Fact: Did you know you can use your phone's panorama feature vertically? Try it sometime, it's fun! 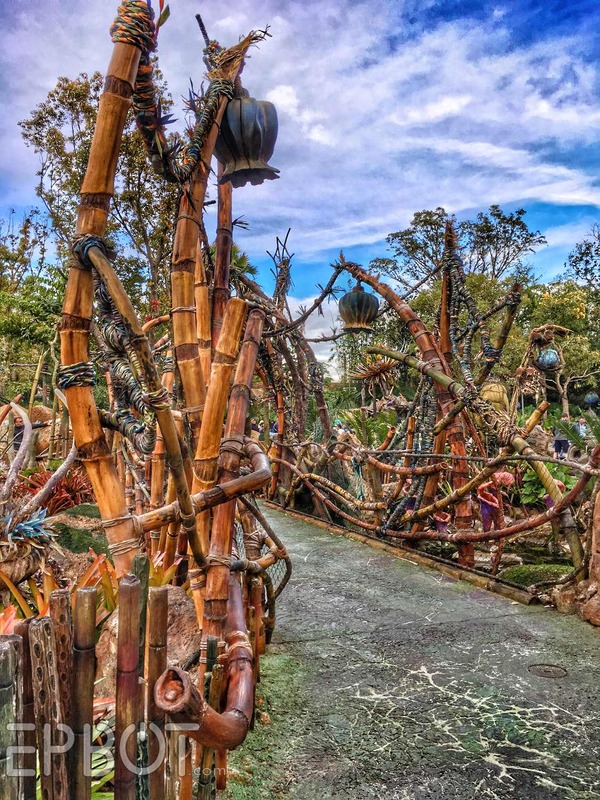 Pandora is one of the trickiest areas in Disney to photograph, so keep in mind every decent photo you see of it - including mine - has been edited juuuuust about to death. You don't need a tripod and fancy DSLR, though; I shot and edited everything here on my iPhone. I can't tell you how much of a difference editing makes... so let me show you! Looks like a lost cause, right? Most of the time my pics aren't QUITE that different, but I hope this shows you how editing can be an art form. It flexes all your creative muscles and lets you make something totally new, right on your phone! Plus it's easy and free, if you use an app like SnapSeed. Ahh, I love Before & Afters. Let's do another one. I tried to make this one more dream-like and glowy. If your phone has an HDR function, definitely turn that on for backlit shots like this. It's not a huge difference, but it can help. I love that twisty trunk! Finding unusual angles to avoid the crowds is half the challenge, half the fun. For the record I don't actually know what I'm doing; I just play around with settings 'til I like the look. You can also get sliced beef or fried tofu in your bowls, which are both pretty good... but trust me, you want the chicken. 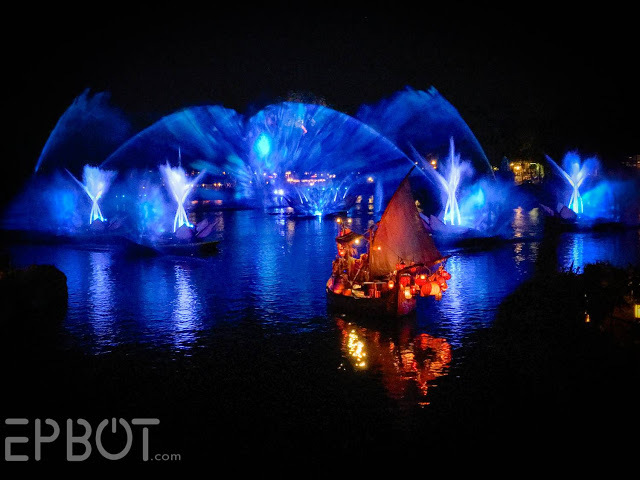 We ended our day with a viewing of Rivers of Light, which I covered last year when it first opened. I'm sad to say the stadium seating for the show was a disappointment; our view was obstructed by half a dozen light poles and we were way off-center, so I couldn't even try to take photos. From this vantage point (again, standing on the bridge) the two seating stadiums are on either side - one behind the blue boat and one behind the orange one. The bridge is directly in the middle, looking straight down the performance area of the lake. Obviously some of the stadium seating is better than where we were, but the premium sections are reserved for dining packages (harrumph) and Fast Pass holders, so the odds are NOT in our favor, ha. 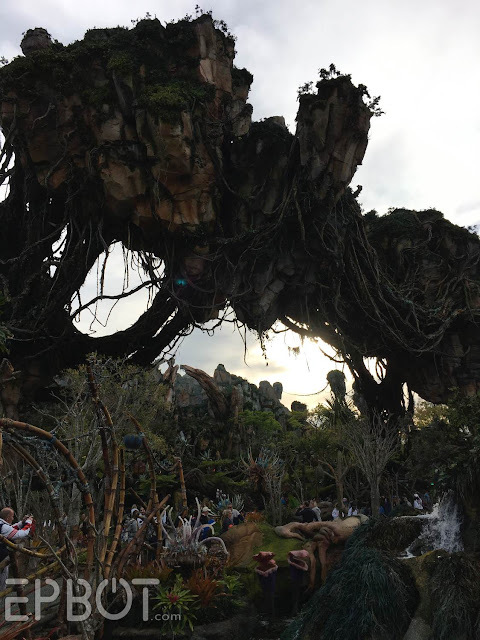 Hope you guys enjoyed your virtual meander through Pandora with me! Any requests for next time? We have about 3 more days of below-80-degree weather here in Florida, so I'm taking advantage while I can! I wish we got perks like that! At Disneyland (and when I had the Disneyland Disney World combo) all we get is a discount on food and merchandise. If you pay for the two highest level tiers ($1000+ at Disneyland now), you get "free" parking, Photopass and Maxpass (Disneyland's pay-per-day Fastpass). Oooh, I use BeFunky on the computer sometimes, but I don't have the app. I'll look into them both, thanks! The dining package is totally worth it, though! 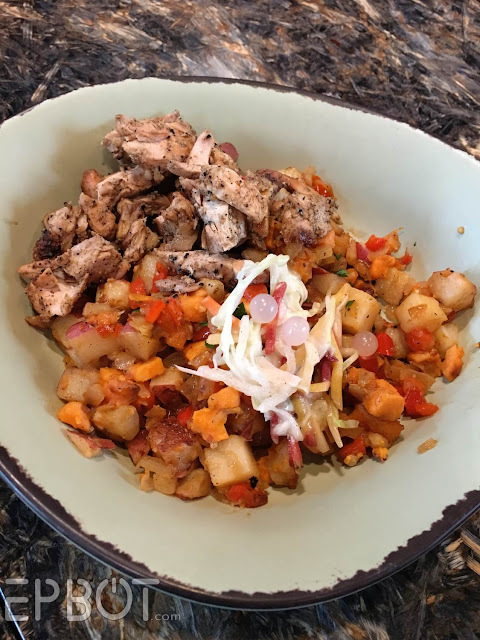 We love Tiffins (best restaurant at the parks, IMO) but it's super pricey, actually cheaper to eat there with the Rivers of Light dining package. The seating gave us a great view when we were there - the cast member who let us in tipped us off about sitting near the bridge. Agreed! The food there is AMAZING, and the package is totally worth it. 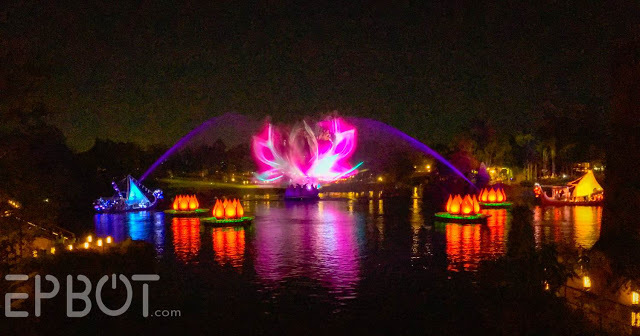 And my son still adores the glowing lotus flower popcorn bowl they gave us, ha. We will be there in early June. Last year, our Pandora day was super gray, and all my pictures were disappointing, no color in them at all. I know nothing about editing, but this year I'll try to take the plunge and see what I can do. I love your pictures- I can't wait to get back! I had the tofu there 2 weeks ago and it was one of the best dishes I've ever had in my life! My whole party LOVED the food. 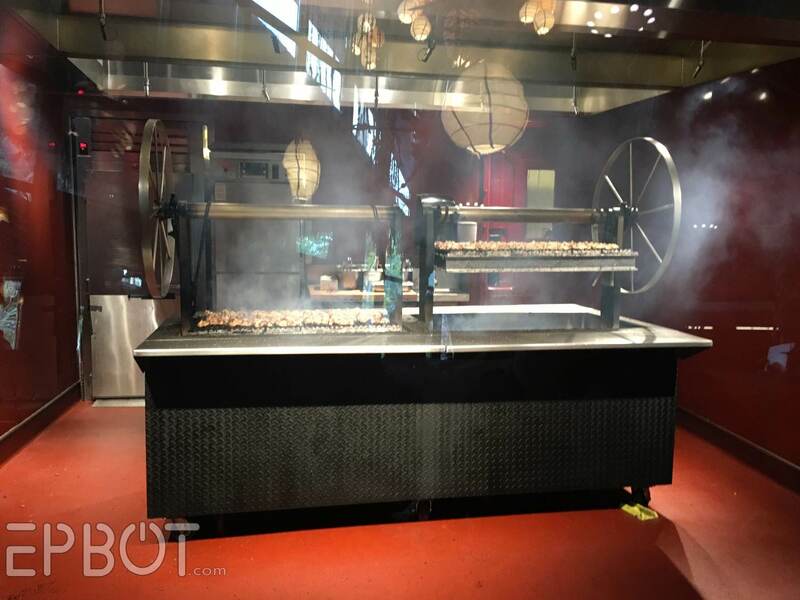 It was by far the best meal we had on our entire DisneyWorld vacation! Well done!! Your editing skills make all of the generation Zs jealous! You make it an art form. You could probably market your skills in a Yahoo business directory, I'm sure they'll come to you. 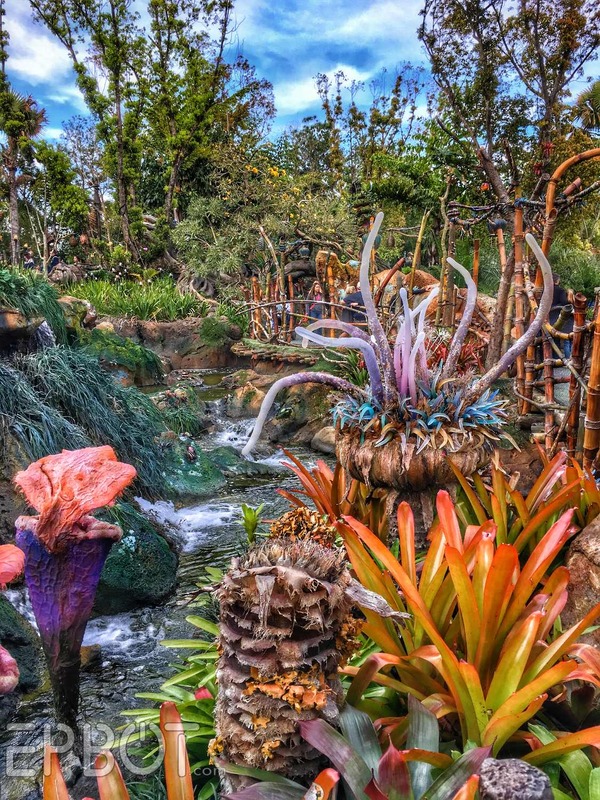 Your trip made me want to visit Pandora to see it for myself. Your gorgeous shots of Pandora remind me of Thra in The Dark Crystal (my faverave movie of all time). Thanks very much for this post! So fortuitously timed for me - I just started researching the family's next WDW trip and Pandora wasn't open the last time we went. 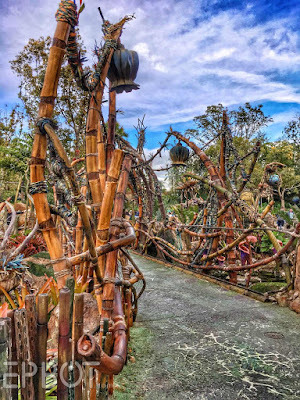 Can I just say, thanks for your previous posts on Disney as well, I remember years ago you posted http://www.epbot.com/2012/08/mailbag-what-should-i-see-at-walt.html and it had recommendations of quiet spots. 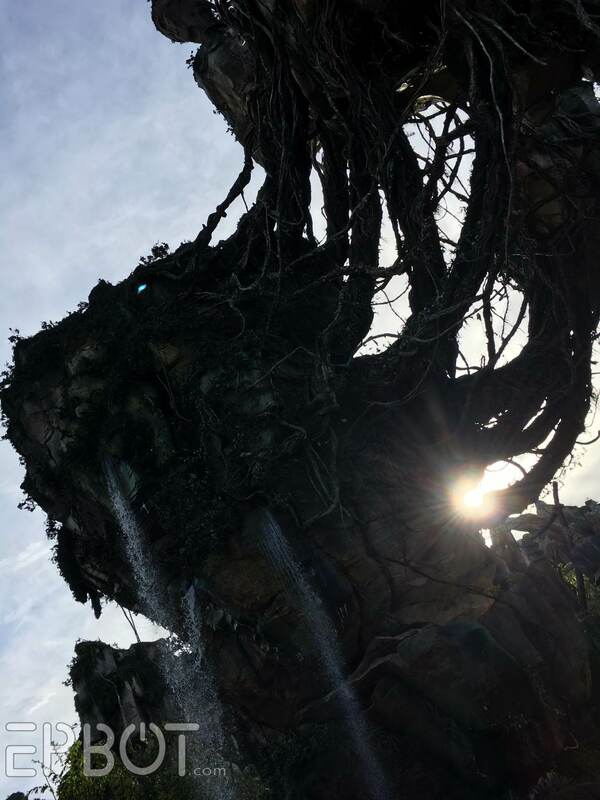 And also your post last December on being able to ride Universal's Forbidden Journey and AK's NRJ (Pandora boat ride) http://www.epbot.com/2017/12/monster-slaying-for-holidays.html - that post made my heart sing! I had so much vicarious joy for you and John. 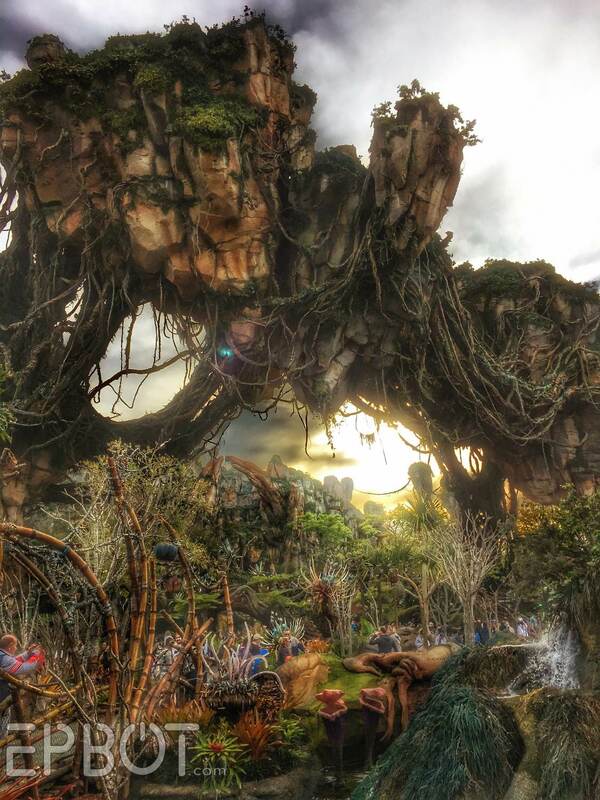 I look forward to visiting Pandora now! My partner and I got to visit the parks back in November and Pandora was just so amazing to see! We made a point of experiencing it both during the day and at night once all the bioluminescence turns on. Lots and lots of photos were taken. 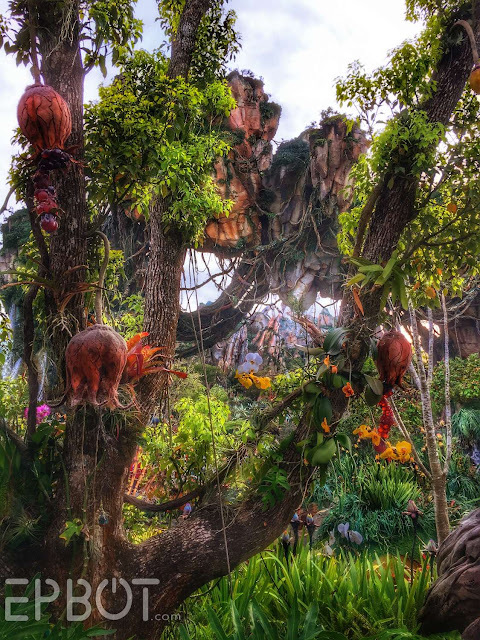 Our favorite yum moment in Pandora was actually a drink. 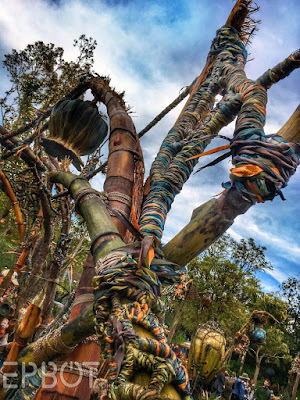 I'm not sure if you've tried it yet but if you haven't, I highly suggest adding the Night Blossom to your next Pandora meal. I'm not sure if it's available in the Canteen itself since we picked it up from Pongu Pongu nearby. We're kind of still obsessed with it. 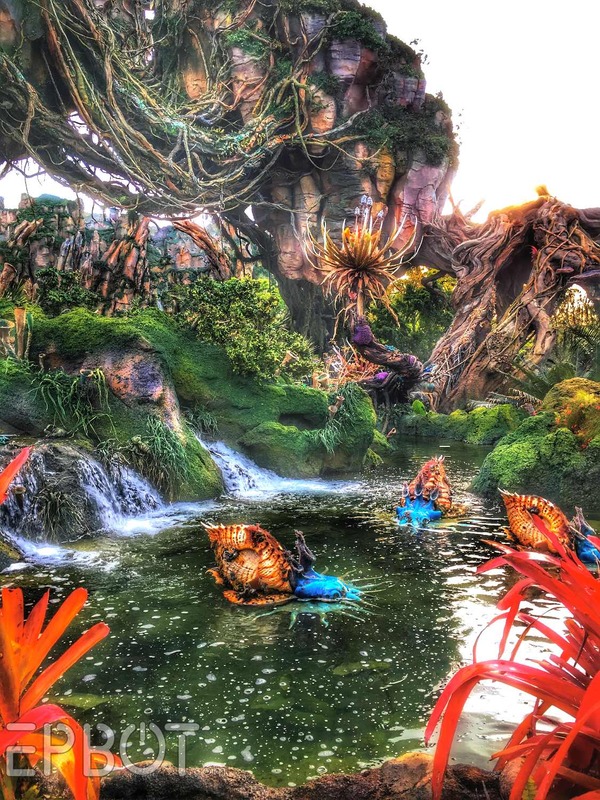 Oh, and if you ever feel up to it, the Flight of Passage ride is absolutely amazing (and even worth the 3 hour wait in line). They truly out-did themselves with the experience of that attraction. I was a CareerStart cast member many years ago and I miss the parks like crazy. November was the first time I had been back in over 10 years. 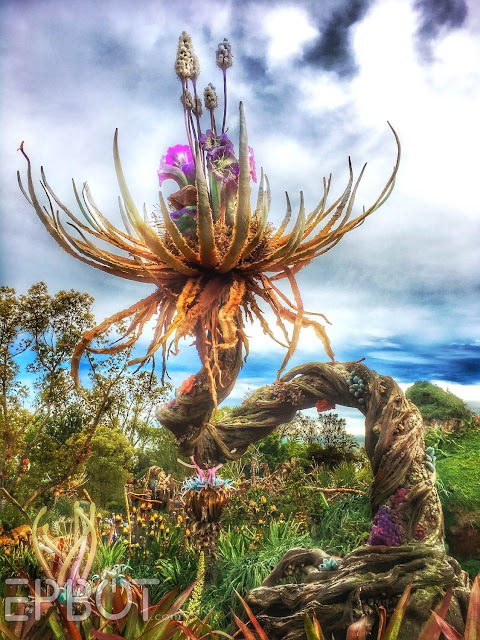 Getting to experience it vicariously through your photos helps sooth the ache of missing Disney so thank you SO much for sharing.